At least 1,000 people on Saturday attended a procession held at the coastal city of Jaffa ahead of "Nakba Day" – the Palestinian day of mourning over the inception of the State of Israel. The procession moved along Jaffa's main street Sderot Yerushalayim and blocked traffic in both directions. Protesters waved Palestinian flags and signs reading: "We have the right of return", "we will not leave Jaffa" and "From Jaffa to Beirut – one people will not perish." The crowd chanted slogans against the Israeli government, calling it "a terror government." Baqa al-Gharbiyye resident Ali Moasi told Ynet, "We came to the protest in order to convey a message to the Israeli establishment and the government of Israel; we will not keep silent over our rights and continue the struggle – no matter the cost. "All the racist laws that the Knesset legislated gave us more motivation and power to protest and struggle without fearing the government or Avigdor Lieberman," he added. A Jaffa resident also participating in the protest added that "eventually we will return to our occupied lands, and will never forget our Nakba. It will remain engraved in our memories, and I say to the government of Israel – it makes no difference how much you acts against us, you will eventually lose and regret your actions." 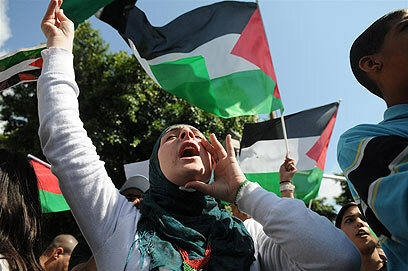 Linking between the "Nakba Day" protests and the recent uprisings across the Arab world, the Jaffa resident said, "Just as is happening in the Arab world, one day the Israeli-Arab population will explode and go out on the streets, protesting against the government and all the racists. "They will demand rights and the right of return, even if it costs them their lives," he noted. The procession was organized by members of youth movements in Jaffa and Lod. Arab Members of Knesset did not attend the protest, although it is considered one of the main events ahead of "Nakba Day." "I regret that no Arab MKs participated in the protest. 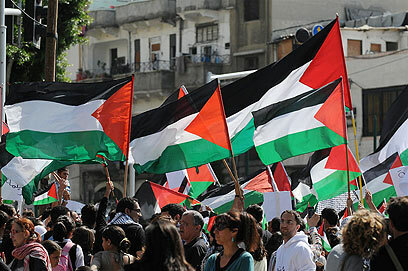 It is irresponsible and makes the Arab residents lose their trust in them," said a protester. Shortly prior to the procession, a group of protesters arrived to the Tel-Aviv promenade and got off the bus while waving Palestinian flags, prompting passersby to spit on them while calling out slurs. The Arab protesters responded with more slurs and returned to the bus. See all talkbacks "Hundreds mark 'Nakba Day' in Jaffa"